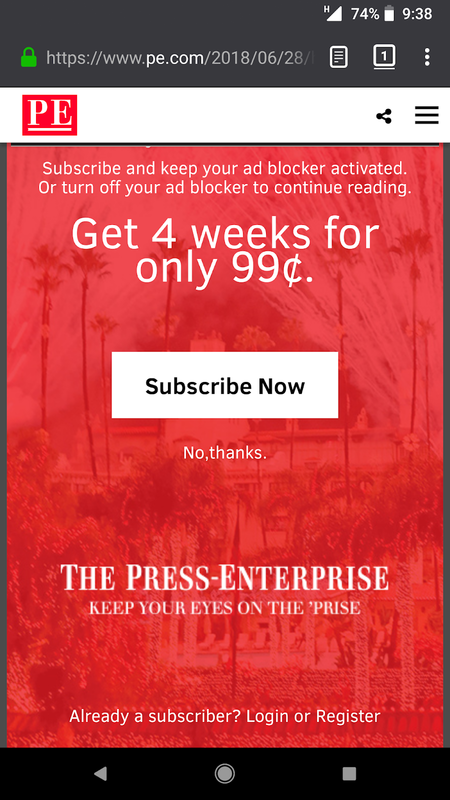 Ad-blocker-blockers hit a new low. What's the solution? 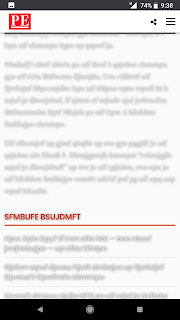 That's not me greeking the article so you can't see what article I was reading. 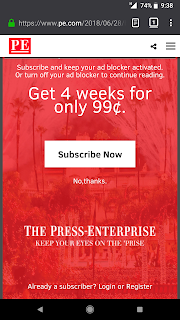 The ad-blocker-blocker did it so that a clever user or add-on can't just set the ad-blocker-blocker's popover to display:none or something. The article is now incomprehensible text. The second thought I had was, how do you handle this? I'm certainly sympathetic to the view that we need stronger local papers for better local governance, but print ads are a much different beast than the dreck that online ads are. (Yes, this blog has ads. I don't care if you block them or not.) Sure, I could have subscriptions to all the regional papers, or at least the ones that haven't p*ssed me off yet, but then I have to juggle all the memberships and multiple charges and that won't help me read papers not normally in my catchment area. I just want to click and read the news, just like I can anonymously pick up a paper and read it at the bar. One way to solve this might be to have revenue sharing arrangements between ISPs and papers. It could be a mom-and-pop ISP and the local paper, if any of those or those still exist, or it could be a large ISP and a major national media group. Users on that ISP get free access (as a benefit of membership even), the paper gets a piece. Everyone else can subscribe if they want. This kind of thing already exists on Apple TV devices, after all: if I buy the Spectrum cable plan, I get those channels free on Apple TV over my Spectrum Internet access, or I pay if I don't. Why couldn't newspapers work this way? Does net neutrality prohibit this? 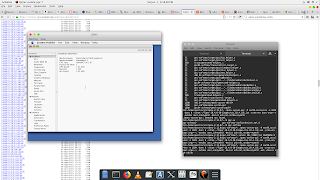 TenFourFox Feature Parity Release 8 beta 1 is now available (downloads, release notes, hashes). There is much less in this release than I wanted because of a family member in the hospital and several technical roadblocks. Of note, I've officially abandoned CSS grid again after an extensive testing period due to the fact that we would need substantial work to get a functional implementation, and a partially functional implementation is worse than none at all (in the latter case, we simply gracefully degrade into block-level <div>s). I also was not able to finish the HTML <input> date picker implementation, though I've managed to still get a fair amount completed of it, and I'll keep working on that for FPR9. The good news is, once the date picker is done, the time picker will use nearly exactly the same internal plumbing and can just be patterned off it in the same way. 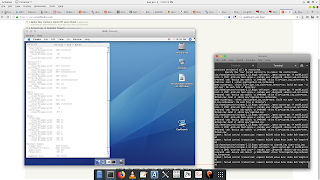 Unlike Firefox's implementation, as I've previously mentioned our version uses native OS X controls instead of XUL, which also makes it faster. That said, it is a ghastly hack on the Cocoa widget side and required some tricky programming on 10.4 which will be the subject of a later blog post. That's not to say this is strictly a security patch release (though most of the patches for the final Firefox 52, 52.9, are in this beta). The big feature I did want to get in FPR8 did land and seems to work properly, which is same-site cookie support. Same-site cookie support helps to reduce cross-site request forgeries by advising the browser the cookie in question should only be sent if a request originates from the site that set it. If the host that triggered the request is different than the one appearing in the address bar, the request won't include any of the cookies that are tagged as same-site. For example, say you're logged into your bank, and somehow you end up opening another tab with a malicious site that knows how to manipulate your bank's transfer money function by automatically submitting a hidden POST form. Since you're logged into your bank, unless your bank has CSRF mitigations (and it had better! ), the malicious site could impersonate you since the browser will faithfully send your login cookie along with the form. The credential never leaked, so the browser technically didn't malfunction, but the malicious site was still able to impersonate you and steal your money. With same-site cookies, there is a list of declared "safe" operations; POST forms and certain other functions are not on that list and are considered "unsafe." Since the unsafe action didn't originate from the site that set the cookie, the cookie isn't transmitted to your bank, authentication fails and the attack is foiled. If the mode is set to "strict" (as opposed to "lax"), even a "safe" action like clicking a link from an outside site won't send the cookie. Same-site cookie support was implemented for Firefox 60; our implementation is based on it and should support all the same features. When you start FPR8b1, your cookies database will be transparently upgraded to the new database schema. If you are currently logged into a site that supports same-site cookies, or you are using a foxbox that preserves cookie data, you will need to log out and log back in to ensure your login cookie is upgraded (I just deleted all my cookies and started fresh, which is good to give the web trackers a heart attack anyway). Github and Bugzilla already have support, and I expect to see banks and other high-security sites follow suit. To see if a cookie on a site is same-site, make sure the Storage Inspector is enabled in Developer tools, then go to the Storage tab in the Developer tools on the site of interest and look at the Cookies database. The same-site mode (unset, lax or strict) should be shown as the final column. FPR8 goes live on June 25th. 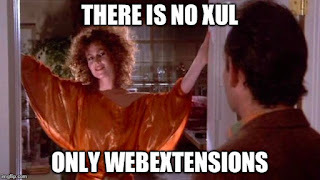 WebExtensions (there is no XUL) took over with a thud seven months ago, which was felt as a great disturbance in the Force by most of us who wrote Firefox add-ons that, you know, actually did stuff. Many promises were made for APIs to allow us to do the stuff we did before. Some of these promises were kept and these APIs have actually been implemented, and credit where credit is due. But there are many that have not (that metabug is not exhaustive). More to the point, there are many for which people have offered to write code and are motivated to write code, but we have no parameters for what would be acceptable, possibly because any spec would end up stuck in a "boil the ocean" problem, possibly because it's low priority, or possibly because someone gave other someones the impression such an API would be acceptable and hasn't actually told them it isn't. The best way to get contribution is to allow people to scratch their own itches, but the urgency to overcome the (largely unintentional) institutional roadblocks has faded now that there is somewhat less outrage, and we are still left with a disordered collection of APIs that extends Firefox relatively little and a very slow road to do otherwise. Or perhaps we don't have to actually rely on what's in Firefox to scratch our itch, at least in many cases. 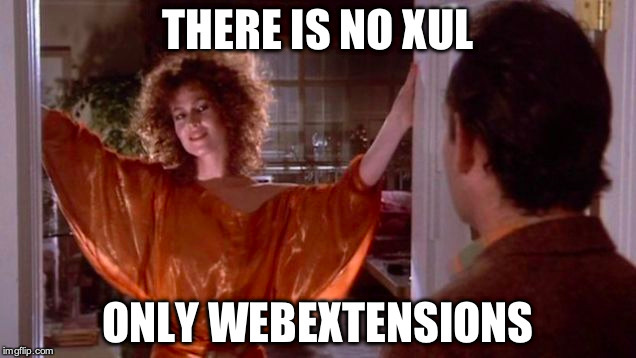 In a potentially strategically unwise decision, WebExtensions allows native code execution in the form of "native messaging" -- that is, you can write a native component, tell Firefox about it and who can talk to it, and then have that native component do what Firefox don't. At that point, the problem then becomes more one of packaging. If the functionality you require isn't primarily limited by the browser UI, then this might be a way around the La Brea triage tarpit. Does this sound suspiciously familiar to anyone like some other historical browser-manipulated blobs of native code? Hang on, it's coming back to me. I remember something like this. I remember now. I remember them! If you've been under a rock until Firefox 52, let me remind you that plugins were globs of native code that gave the browser wonderful additional capabilities such as playing different types of video, Flash and Shockwave games and DRM management, as well as other incredibly useful features such as potential exploitation, instability and sometimes outright crashes. Here in TenFourFox, for a variety of reasons I officially removed support for plugins in version 6 and completely removed the code with TenFourFox 19. Plugins served a historic purpose which are now better met by any number of appropriate browser and HTML5 APIs, and their disadvantages now in general outweigh their advantages. Mozilla agrees with this, sort of. Starting with 52 many, though not all, plugins won't run. The remaining lucky few are Flash, Widevine and OpenH264. If you type about:plugins into Firefox, you'll still see them unless you're like me and you're running it on a POWER9 Talos II or some other hyper-free OS. There's a little bit of hypocrisy here in the name of utilitarianism, but I think it's pretty clear there would be a pretty high bar to adding a new plugin to this whitelist. Pithily, Mozilla has concluded regardless of any residual utility that plugins kill kittens. Nevertheless, we're back in a situation where we actually need certain APIs to be implemented to make certain types of functionality -- functionality which was perfectly acceptable in the XUL addons era, I might add -- actually still possible. These APIs are not a priority to Mozilla right now, but a certain subset of them can be provided by a (formerly discouraged) native component. It's time to kill some kittens. On the other hand, this is the only way right now it's going to work at all. I don't think Mozilla is going to move on these pain points unless they get into the situation where half the add-ons on AMO depend on external components they don't manage. So let the kitten killing begin. If you've got an idea and the current APIs don't let you implement it, see if a native component will scratch your itch and increase the pressure on Mountain View. 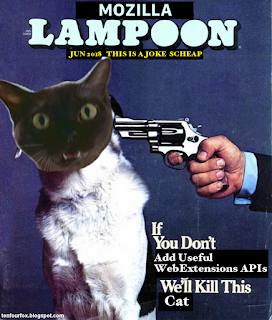 After all, if Mozilla doesn't add useful WebExtensions APIs, there's no alternative but feline mass murder. Provocative hyperbole aside, bug reports and pull requests appreciated for OverbiteNX. 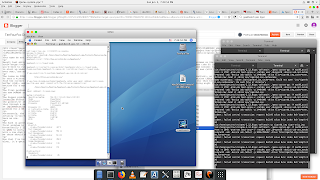 At some point in the near future the add-on piece will be submitted to AMO, which I expect to pass the automatic scanner since it doesn't do any currently proscribed operations, and then it's just a matter of keeping the native component in sync for future releases. Watch the Github project for more. And enjoy Gopherspace. Just don't tell the EU about it. What is Apple trying to say with macOS Mojave? That it's dusty, dry, substantially devoid of life in many areas, and prone to severe temperature extremes? Oh, it has dark mode. Ohhh, okay. That totally makes up for everything and all the bugs and all the recurrent lack of technical investment. It's like the anti-shiny. In other news, besides the 32-bit apocalypse, they just deprecated OpenGL and OpenCL in order to make way for all the Metal apps that people have just been lining up to write. Not that this is any surprise, mind you, given how long Apple's implementation of OpenGL has rotted on the vine. 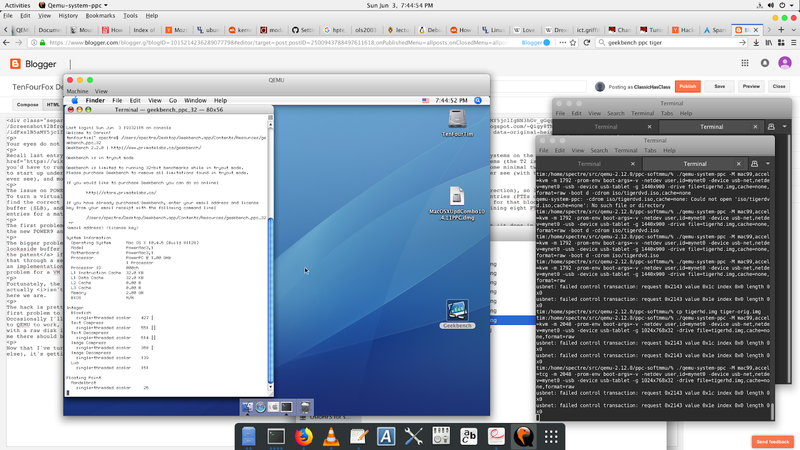 It's a good thing they're talking about allowing iOS apps to run, because there may not be any legacy Mac apps compatible when macOS 10.15 "Zzyzx" rolls around. Yes, looking forward to that Linux ARM laptop when the MacBook Air "Sierra Forever" wears out. I remember when I was excited about Apple's new stuff. Now it's just wondering what they're going to break next.